When you take on a new project, do you have a sense of fear, or are you fully committed and excited for the challenge? For many people, achieving success comes with fear. It is a common first response to tackling a new challenge. This fear, however, might not be from what you think. Fear of failure is a common citation for people’s hesitance to take on something new. Fear of success, however, is also common. Those people who find themselves hesitant to take the first step because they are fearful that they will succeed is usually because they do not know how they will be able to handle the success. But if you’re reaching toward a goal, success is your ultimate goal. And, the psychology of success is much more than reaching milestones or making money. Success is the sixth TIGERS principle. From a team perspective, achieving success is more than accomplishing goals or making a lot of money. It’s also the satisfaction the team’s members share in their accomplishments, says TIGERS Among Us. Without employee satisfaction, businesses find it difficult to attract and retain employees with talent. Talented employees who do not experience satisfaction from achieving success use their positions as a stepping stone to advance their careers. This results in higher levels of employee turnover, which can prove to be quite costly for employers. 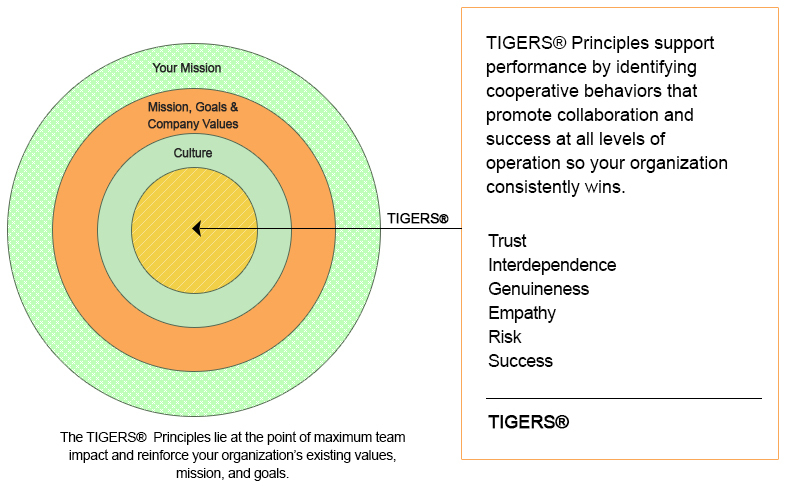 When taking into consideration the satisfaction of employees, success is highly correlated with the other five TIGERS principles. These principles are trust, interdependence, genuineness, empathy and risk. When an organization improves its financial success and employee satisfaction, the team’s perception of trust and the other values will also improve. In a collaborative work culture where there is high cooperation among departments and employees, there is more opportunity for group members to experience the psychological satisfaction of success. In these organizations, employees are empowered to solve problems, generate ideas and refine work procedures. As a result, employees have a clearer understanding of their company’s operations. They are also more entrepreneurial because they know how their contributions support achieving goals. As a result, employees are more committed and accountable to success. Understanding the role of work culture for achieving success is important. Here is a list of behaviors to look for in your organization. Commitment and ownership of company goals at all levels of the organization. Corporate values that align with the employees’ personal values. Involving as many workers’ ideas into goal implementation as practical and appropriate. Establishing and communicating quality standards at all levels of operation. Establishing and communicating system refinement standards at all levels of operation. Establishing and communicating plans and work design strategies for all levels of operation. Evaluating and removing operational barriers. Understanding the importance of employee happiness. Lack of personal commitment and accountability for achieving goals. Withholding information that frustrates goal achievement. Lack of understanding of how personal work serves goals. Poor morale and ambivalence toward work. Poor procedural communication resulting in process and procedure confusion. Short-term problem-solving that frustrates long-term strategies. Inadequately staffed and funded systems and strategies. Corporate values that conflict with on-the-ground behaviors. High levels of employee disengagement and apathy. 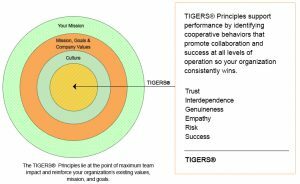 When the six TIGERS principles function harmoniously, the combined effect produces a dynamic group of people who are inspired, enjoy coming to work, feel they are growing personally and professionally, and who could not imagine working anywhere else. Successful teams do not evolve by chance. They are lead and facilitated by trained managers. Managers who are good facilitators bring people together to work toward solutions. As a result, groups accomplish more with high levels of commitment and accountability. Taking the plunge to achieve goals can be a huge hurdle for many people. Fear holds people back. One fear is the fear of success. Success is the ultimate goal for any endeavor. As a core principle, success encompasses so much more than reaching a goal or making a lot of money. 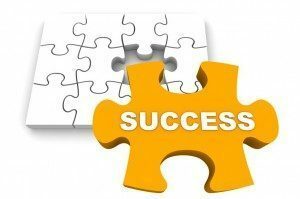 Success also includes creating a work environment that encourages employee buy-in and accountability, which ultimately leads to greater employee satisfaction and lower turnover. To achieve this type of environment, leaders who invest in manager as facilitator training promote group endeavors that ultimately result in success that not only achieves goals but also high levels of employee satisfaction. Care to dive deeper into this achieving success conversation? Crampton, Dianne. TIGERS Among Us. Three Creeks Publishing (2010).